Oil floats ashore at the Grand Isle East State Park on Grand Isle, Louisiana. BP pressed on with a risky bid to plug a ruptured oil well it said was going as planned, while new data showed the huge Gulf of Mexico slick is now the worst spill in US history. BP pressed on Friday with a risky bid to plug a ruptured oil well it said was going as planned, while new data showed the Gulf of Mexico spill is the worst in US history. Amid the looming environmental catastrophe, there were growing fears for the health of cleanup workers exposed to the crude and chemical dispersants, some of whom had to be airlifted for treatment after falling sick while out at sea. Even if BP's "top kill" maneuver succeeds in capping the leak, millions of gallons of crude are sloshing about in the Gulf waters, and a visibly angered President Barack Obama moved to clamp down on the oil industry. "If nothing else, this disaster should serve as a wake-up call," Obama said at his first formal White House press conference in 10 months, called specifically to address the crisis triggered by an April 20 explosion that rocked a BP-leased drilling rig off the Louisiana coast. "My job is to get this fixed," Obama said, a day before his second trip to the Gulf of Mexico to oversee disaster relief efforts. 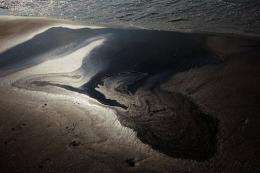 The British energy giant said Friday the oil spill had cost the firm close to one billion dollars while BP's market value has also dropped by billions. "The cost of the response to date amounts to about 930 million dollars, including the cost of the spill response, containment, relief well drilling, grants to the Gulf states, claims paid and federal costs," BP said in a statement. BP said it had paused the "top kill" for some 16 hours on Thursday to monitor the results, before resuming it again as night fell. "Nothing's actually gone wrong or unanticipated," BP chief operations officer Doug Suttles stressed at a press conference on the latest bid to cap the ruptured pipe on the seabed nearly a mile (1,600 meters) below the surface. He said it was important for engineers to keep checking pressures as robotic submarines force-fed heavy drilling fluids into the broken pipe in order to stop the oil flow long enough to plug it with cement. Suttles said he expected to know on Friday or Saturday whether the operation has worked. "We are very pleased with the performance of the equipment so far," he told CNN. The spill will have far-reaching implications for the livelihoods of those living in the southern Gulf states, as well as the oil industry in the area. Obama slammed past lax regulation as he laid out steps to bar any new deepwater oil exploration for six months and suspend some permits and lease sales off the vulnerable coasts of Alaska and Virginia. "In this instance, the oil industry's cozy and sometimes corrupt relationship with government regulators meant little or no regulation at all," he said. The president also lashed BP, suggesting it may have sought to downplay the true extent of the economic and ecological disaster now threatening Louisiana, Alabama, Mississippi and Florida. Government scientists meanwhile released data Thursday showing the oil may have been flowing from the burst pipe at a rate up to four times higher than previous estimates by BP and the federal government. The new estimates put the flow rate at 12,000 to 19,000 barrels (504,000 to 798,000 gallons) a day -- much higher than the previous estimate of 5,000 barrels. That would mean between 18.6 million gallons and 29.5 million gallons of oil have seeped into the Gulf -- far more than the roughly 11 million gallons of crude spilled in the 1989 Exxon Valdez disaster off Alaska. With 100 miles (160 kilometers) of Louisiana coastline already contaminated, there are fears US officials may order the burning of the state's unique marshlands, home to a variety of endangered birds and mammals. Obama dismissed charges the government response had been too slow, but said it was legitimate to question whether BP was "being fully forthcoming about the extent of the damage." US Coast Guard chief Thad Allen, who is coordinating the government's battle against the spill, said the "top kill" maneuver appeared to be having some success, noting that "as long as the mud is going down, the hydrocarbons are not coming up." All 125 commercial fishing boats helping to clean up the oil off Louisiana were recalled after seven workers reported health problems. The cause of the workers' illnesses is under investigation, said BP's Suttles, as he sought to calm public fears over the chemical dispersant used to break down the oil for faster decomposition in the water. "As I've stated many times, if there is a less toxic, more effective product (than Corexit), we'll switch to it, without a doubt," he said. BP plays nice when the government is looking over their shoulders but the reality is that without government oversight they would continue to asset the leak was only 5,000 barrels/day. They were clearly trying to deceive the public and press. I do not pity their $1b bill because it won't offset the damages in the end; even if/when after investigation they incur more charges it will pale in comparison to the overall destruction. Maybe some thoughtful politician will have the cajones to bring reform of the oil industry to fruition.